Who Was the Biblical Prophet Samuel? "Who Was the Biblical Prophet Samuel? Prolific author Israel Drazin's new book answers this question with penetrating insight, refreshing clarity, and the same erudite originality that runs through all of Dr. Drazin's books. This is a must-read for readers interested in Jewish history and its fascinating mysteries!" The Columbia Review. More than any other figure in Jewish history, the prophet Samuel singlehandedly changed the course of the nation’s governance from a loose tribal association, rife with bitter conflicts, to a centralized monarchy–and Samuel did it not once (with his instigation of the Saul’s kingdom, the first-ever Israelite monarchy) but twice (with his ‘unseating’ of Saul and anointing the shepherd-boy David). 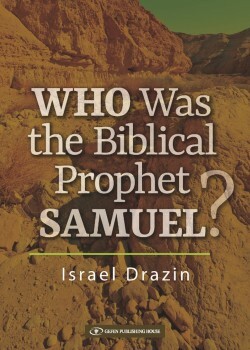 Considering the outsized impact of this religious leader on the political, national and religious events of his time, as well as his lasting impact on Jewish history and the longing for the restoration of the ‘House of David’ to its former glory, one has to wonder “Who Was the Biblical Prophet Samuel?” Prolific author Israel Drazin’s new book answers this question with penetrating insight, refreshing clarity, and the same erudite originality that runs through all of Dr. Drazin’s books. This is a must-read for readers interested in Jewish history and its fascinating mysteries!